Elite Scan offers cattle scanning services for pregnancy using the latest ultrasound technology. With over 15 years of experience in the cattle industry, including dairy, beef and feedlotting, Shaun at Elite Scan understands that producers are looking for efficient and economic ways to improve their operation. Elite Scan offers ultrasound pregnancy testing services that reduce downtime and have the potential to be economically beneficial in the long term. Using ultrasound scanning technology to age the foetus gives the cattle producer the opportunity to precisely manage the cattle, which can be advantageous in times of drought and feed shortages. 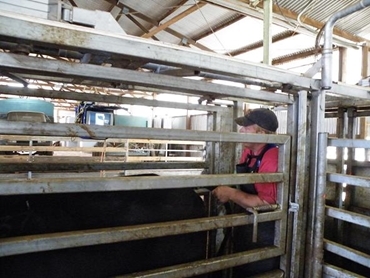 Additionally, cattle ultrasound pregnancy testing assists in the management of cattle that are unproductive as they can be sold or potentially re-mated. Elite Scan recommends performing the ultrasound scanning when the foetus is between 35 and 60 days, as the pregnancy falls over the pelvic rim after this period making it trickier to locate a pregnancy and age the foetus. Elite Scan offers competitive rates for ultrasound pregnancy scanning services for cattle. Using advanced ultrasound technology can give the producer an edge over competitors as decisions can be made earlier, saving money in the long run and potentially increasing profits.